Blog My First Year in the Philippines!!!! My First Year in the Philippines!!!! Hard to believe it, but tomorrow will mark my one year anniversary the Philippines. Today is November 25th, and it just happens to be Dumaguete’s Fiesta, so the city is mobbed with people taking part in the festivities all around town. It’s funny – I know I talk about “misadventures” a lot, but my time in the Philippines literally started with a misadventure. One year ago I took my first ride into downtown Dumaguete, and it was one year ago I was instantly overwhelmed by veritable tide of human congestion and thinking “Dear God, what have I gotten myself into?” Of course, at the time I didn’t realize that it was Fiesta and that the city’s population has basically tripled. Chock it up (as it usually works out) to ignorance as to all things Filipino. All I felt was the crowds, the heat and congestion…. So did the misadventure commence! And so does the misadventure continue. So without any further ado, let’s take a look at some of the things that I have learned, observed and experienced this past year. First off – as I did in my six month recap on life in the Philippines – let’s take a look at the people, places and things that have made this misadventure what it is. In the second part, I’ll take a look as to how these things (and life in general here) have affected me, and how the journey (as opposed to the destination) has become the reward. Apologies yet again for continuing to perpetuate a stereotype, but Filipinos are without a doubt the friendliest and most open people I have ever met in my 47 years on God’s green earth. If you haven’t been to the Philippines before, you will note this fact soon after your arrival. If you are like me, hailing from a Westin city where one avoids eye contact and never smiles at strangers, this can be a bit of an adjustment. I noted before that soon after arriving I had to relearn how to smile. This sounds a bit odd and perhaps a bit contrived, but it’s the God’s honest truth. You can see more examples of this by simply walking around: Filipinos looked each other in the eye, exchange salutations, friends walk down the street hand in hand or with their arms around each other, and they typically travel around in social groups. If you are alone, and go to a restaurant for dinner, don’t be surprised if your server verbally expresses his or her dismay at you eating alone. I heard about this before coming to the Philippines, and when I actually experienced it, I couldn’t help but laugh. Again, it’s different here. Just about everyone speaks English and the Philippines. This is quite helpful, because I have found myself time and time again caught up in some sort of misadventure or another and in desperate need of help. My favorite example of this is the time that I got a flat tire and Mike Jara. My spirit was also flat and I didn’t have a Jack or lug nut wrench. Thankfully, Roberts Tire (QuickTire) was open, and they sent out someone to “rescue” me. And, yes – that’s what they actually call it – “rescue.” The guys from Roberts had taken off my tire and left me by the truck to watch it while he fixed it. It was the middle of the afternoon and hot as blazes, with the sun slamming down and not a spot of shade to be seen. A few minutes later I heard a noise behind me. I turned to find an old Filipino dragging out a plastic chair. He set it in a spot of shade next to his house and beckoned me over. I gratefully accepted his hospitality and he favored me with a gap-toothed grin and disappeared back into his house. Another few minutes past and he emerged back with an ice-cold Coca-Cola “zacto” (8 ounce bottle of Coke) which he passed to me with another smile. Sounds like a product placement, right? But that’s just one example of how Filipinos will go out of their way to help others. Thanks again, kuya Coke Guy and Robert’s Tire for rescuing me. You guys rock! Finally, I’ve sort of noticed that the Filipinos are – as a whole – a dang good looking people, which might have something to do with the population explosion they’ve been experiencing for the past century or so. And finally, Filipino kids are without a doubt the cutest kids in the world. If you have never had kids and spend any amount of time here, your biological reproductive imperative is going to be at an all time high. Neighbor kids harvesting guava on our wall. The Philippines is gorgeous. I’ve said it before and it deserves reiteration. City areas can be congested messes of humanity, scattered refuse and smog, but head out into the provinces and the rewards are all over – luminous green valleys, sun-kissed beaches, gorgeous sunrises and sunsets, rushing waterfalls, soaring mountains, turquoise waters filled with playful marine life – it’s all there and then some. I’ve done some traveling around this past year, and for that I am very greatful. Mabinay, Dapitan, Dipolog, Pagadian City, Kawasan Falls, Moalboal, Cebu City, Sipalay, Bayawan, Siaton, Dauin, Zambonguita…. The list goes on and on. Traveling is easy as pie here – with the dedicated ferry system, you can hop on your motorcycle and basically get anywhere. Accommodations and food are a lot less than they are in the states, so getting out and not seeing the country would pretty much be a crime. A cove at Sugar Beach, Sipalay. The RP is pushing its tourism industry and rightly so – there’s a lot of cool things about to see and do. The only downside is a crippling lack of signage marking these scenic locations…. But hey, on those days it just goes to show that sometimes the journey itself is the reward. Or at least that is what I tell myself on those WTF days…..
Jeepneys, halo-halo, custom underbones, scintillating crystal caves, rushing waterfalls, ziplines, canopy walks, snorkeling with sea turtles and barracuda, fresh yellow fin kinilaw, mountain rides, sizzling sisig, mano salutations, pasalubong, fiestas, pot lucks, hot springs, cold springs, videoake, ice-cold San Miguels, mind-blowing sunrises and sunsets….. Oh, my – how the list does go on and on. And it’s not just seeing and experiencing these things – it’s learning their history and their place in the country’s culture. In the past year, I haven’t even begun to scratch the surface of what there is to see here. And that’s OK – I plan on staying here for a good long time, so I think I can afford to pace myself just the slightest bit. Again, in the second part of this, we are going to take a look at how this past year has affected me internally. I mentioned before that the journey itself has become the reward – and in the second part, we are going to see how that has come about – ugly realizations and warts included. Physical Changes: I came to the Philippines weighing about 212 pounds. I now weigh about 190. Much of that was loss of muscle mass due to a staph infection and back injury (more on that in a bit), but a good amount of it had to do with it simply being so dang hot – I just didn’t feel like eating all that much. The same thing happened to me while living in Honduras, so the weight loss didn’t come as much of a surprise. I feel OK at a lighter weight, and the only downside is having to have the waistbands of all my shorts and bathing suits taken in. Then again, with the low cost of tailoring, that wasn’t so bad. I also seem to have gotten taller, and for that I blame the incessant humidity. Like a piece of water-soaked wood, I have expanded a few millimeters since arriving – this was apparent the other day while filming a parade when I noted that I could see over the heads of all the Filipino’s around me. J Finally, the sun has given my fish-belly white skin a bit of a glow. A pinkish glow – mind you – but at least it looks a bit better than the zombie corpse look I had been rocking for decades. I have also developed the Teva-tan on my feet which leaves artistic white slashes across by burnished bronze tootsies. Comfort Zone – One of the reasons I moved to the Philippines was to get out of the comfortable rut I had painstaking carved for myself in the United States. Heh, heh – on that front, I can honestely state with more conviction than George W. Bush, “mission accomplished.” Living in a country like the Philippines requires a radical rearranging in how you approach life. Some of these changes are minor like adapting to different tactics when it comes to shopping, driving and traveling about and understanding the concept of “Filipino Time, “ but a good number of them are pretty major, requiring fundamental changes in the way you respond to things going on around you that are out of your control. This is a process, and my success has been a mixed bag at best. The good thing about this is that it forces you to look at the world in a different way and – more importantly – the way in which you allow it to effect you. Some days are better than others: On one I can be gliding around in a detached and serene state of bliss and on the next I can be setting a world record for “WTF’s” muttered in a single day and running back to my air conditioned room to escape the apparent insanity of life here. Gratitude: Speaking of kids, gratitude for what I have is at an all time high after seeing these poor street kids day after day in the streets of Dumaguete. (They’re night after night basically consists of a piece of cardboard strategically laid on a concrete sidewalk.) Again, one of the reasons I came to the Philippines was to get of the insidious grip of entitlement that I had found myself in. Once again, mission accomplished. Oh, I still get it twisted now and again what with my “First World” problems like what kind of computer or phone I need to buy or kvetching over the lack of good pizza in the Phils, but seeing people scraping by for their next meal of rice and dried fish is a bit humbling and quickly puts things back into perspective. Oh woe is me, indeed…. Learning: The Philippines – or anyplace outside of your comfort zone for that matter – is a great place to learn about yourself. Ostensibly this is a great thing, as it affords all of us the unique opportunity to become a better man (or woman) – Think Jack Nicholson in “As Good As It Gets.” Conversely, it can be a rather cutting two-edged blade, because you are going to learn things about yourself that you really don’t want to know. Yep, in the past year, I’ve discovered all new depths of personal insightlessness, egocentricity, hypocrisy, and occasional infantile temper. Fun stuff, that. But I guess that’s all part of the process and has provided more that a few epiphanies about life, the universe and everything along the way. One of my favorite examples of this was the experience I had at Flip-Flops restobar in Dumaguete that challenged my preconceived notions on more than a few things regarding age, lifestyle, freedom and the pursuit of happiness. You can read about that here if you haven’t done so already. It’s just one of the examples of the humbling experiences I have had here in the Philippines. Food: May expats still grumble about the food in the Philippines. I see their point – most of it is salty, fried and a bit vinegary, but dig a little deeper and you can find some pretty good stuff. Michell is pretty much a straight Filipina cook, and her pork adobo, pinakbet, and mongos is pretty frikken delicious. Seafood also abounds, and there are more than a few places around that serve up delectable oceanic fare. My one beef continues to be the lack of vegetables in local eateries, but it’s easy enough to hit the local produce market (with it’s veritable piles of fresh fruits and vegetables), bring it home and cook it up. Or – in our case – have someone who actually knows how to cook, cook it up. The best food I have ever had was in the Phils – fresh, homemade yellow fin kinilaw. Also, the worst food I have ever had was here – unripe mango with shrimp paste and pancit with chicken necks. Ugh…. Housing: Finding the “right” place has been our greatest and longest running misadventure to date. I’ve been talking about it so much that I am as sick of talking about it as you are of hearing it. I can’t stress enough the importance of knowing what you want in a home here and making sure you put in the time and effort to find it. For me, it’s window screens, provision for aircon, security grates, neighbors who aren’t bipolar alcoholics and – if you can find it – lots and lots and lots of shade. Our personal quest for such a place goes on, and hopefully this year we will actually find it. The Heat: Some kid named El Nino seems to be blamed for the latest spell of superheated air that has settled over our little corner of Negros Oriental. The experts on TV say not to worry – this El Nino dude will only be here until March. Just in time for the beginning of summer. The AC was broken at MacDonald’s yesterday and within five minutes I had already sweated through my first t-shirt of the day. Sipping my coffee (scalding hot coffee, of course), I told Michell, “I hate the Philippines….” Right then, a Filipino walked by in a fur-lined winter coat, whistling merrily along without a drop of sweat on him. Ugh. The heat my only real continued gripe with the Philippines. At some point, I am definitely going to check out Tagatay, which – at 2,000 feet – is said to be about six degrees cooler than where we are now. Of course, then all you have to worry about is that durn volcano going off…..
Michell’s scooter gets stolen. Michell’s scooter gets recovered. Experienced my first earthquake at Robinson’s Mall Theater. We were watching Gozilla and I thought it was just the subwoofer and that everyone was running out because it was such a bad movie. Henry from Life Beyond the Sea moves to Dumaguete and starts filming all the places I had on my to-do list. /Arghhh!!!! Michell gets a job working nights but rarely mutters a complaint. Meanwhile, I sleep in and complain about just anything and everything – especially the heat…. Get to see my first barracuda, clownfish and sea turtle. Soon afterwards, I get mauled by a titan triggerfish. After a few years of playing Farcry 3, I find myself living Farcry 3: Every gorgeous overview, roadside village, banca, swaying palm, monitor lizard and radio tower moves it from living room to daily reality. 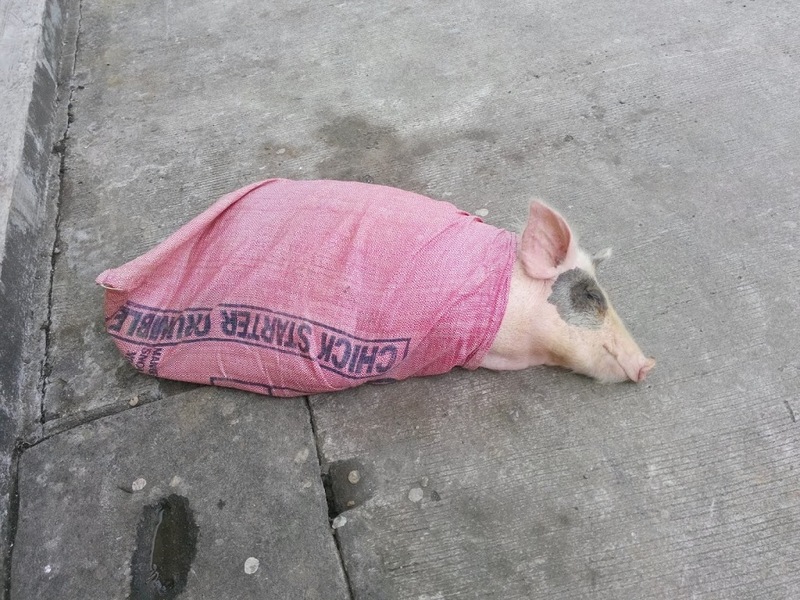 I discover the true meaning of a pig in a poke. Michell graduates college. I travel to Mindanao with it’s eight hour brownouts and am reminded of why I love Negros Oriental (with it’s massive thermo-electric plant) so much. I start our YouTube channel and website. Months later, swamped with comments, emails, the occasional internet troll and actual work, I consider unplugging our YouTube channel and website. I go on my first zipline. A short zipline, granted, but a zipline nonetheless. I run over a juvenile monitor lizard on my way back from Sipalay. Vicious Irish Roman Catholic guilt ensues. 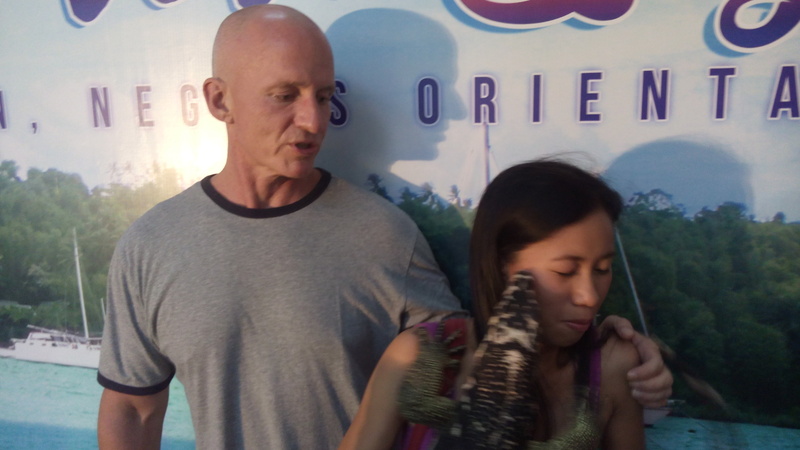 Michell and I take a photo with a full grown monitor lizard at the Banglusan Festival. A relative of the one I killed in Sipalay, it swears revenge and immediately attacks Michell. Great chapter. I follow you on YouTube everyday because the town of my birth, Dumaguete, is the town that I plan to spend my time during retirement. I get the most information from you and Reekay. Keep up the great work. January 2020 is the time that I will be in Dumaguete for good. Please create more videos of the beaches and especially your snorkeling experiences. I am a PADI recreational diver and I create underwater videos also. I just got scuba certification, so I will try to put up more diving videos. Thanks, Joel, and we truly love your town! Very interesting summary of your first year in the Philippines. 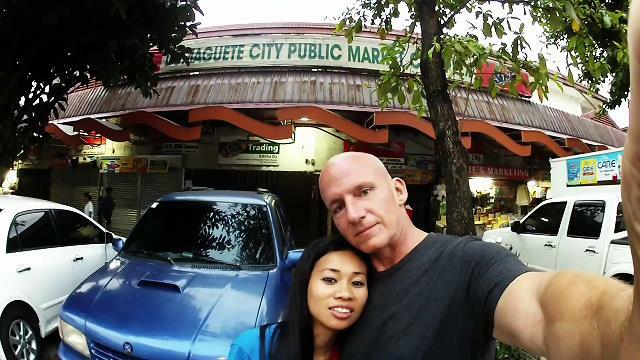 My wife and I are looking forward to our visit to Dumaguete January 22-24. Maybe we can get together for a beer or some paddle boarding. Why didn’t you answer my email ? what was wrong with the question ? Why did you take down my post of “Did you get my email”? I have questions like any one else that sends to you. we are talking about settling down there in the Philippines. She has a nice job and i am retired. you don’t even know me and you won’t answer me, what did I do wrong, so i don’t do it again. Great summary and information. Always catch your Youtube videos, always great and informative. As I said before, wish something was around when I first came to Philippines 2009-2010. I learned a lot then, and from your experiences, that I know I will be better person when I return there 2015 and finally be with my love of my life in Tacloban (she going to college there now. Her family lives on island off SAMAR). Both of you take care! Always be safe! God Bless You both and your families & friends! You both are wonderful together! INGAT! and again SALAMAT! Thanks, Steve. Yeah, YouTube was a big part of me eventually coming to the Philippines, so it’s kind of ironic that we have a YouTube channel now. Thanks again, Steve and take care! Great post, Ned. Keep up the good work! What’s with recent claims that Philippine immigration are imprisoning westerner s on false charges of visa breaches and obtaining bribes before deporting their victims? I have not heard of that – do you have any links? I’ve only read a couple pages of your site but it was very good reading and pretty accurate… Thanks for being honest about the Philippines … Its a great place and the same as others, it has short comings. Yep, it has a good number of shortcomings, most (if not all) of which we have talked about in other posts and videos. It’s definitely not for everyone. My biggest complaint is the heat, and we have figured out how to fix that in the house. During the hottest hours of the day, I just siesta and take it easy. After 4 PM, it’s so much nicer….. Thanks, Ray! Hi Ned and Michell. I have recently become a subscriber to you on YouTube. The first night that I discovered your videos, I think I watched a dozen of them. Slowly working through them. Love the episodes of Michell answers questions, as it gives me more insight. I’m currently long distance dating a Pinay in Danao. She will be coming to visit me here in Australia in the first quarter of next year. Would love to know more about the challenges that Michell has with adapting to (living with) some western attitudes. The challenges of the cultural differences. Not the specific personal traits of Ned, but the western culture traits. It would be great if you made that as a part of one of your upcoming video updates. I could then send the share link to my lady, so that she might also be better prepared. I also will then have more knowledge of the things that just might be a little more difficult for her. Thank you for always being so wonderfully honest in your descriptions. Thanks, Paul. I think the biggest issues are the concepts of personal space/time and differences in communication between the east and west. I’ll see if we can’t do something like that in the near future. A great insight and reflection on your experiences. One of your top ten videos IMHO. Maybe you could do a video on the food. You’ve done some, but more filipino foods. Even one about halo-halo. I thought at first, playing Halo? And then I remembered what it was. Yeah, I wouldn’t mind doing a video on halo-halo. At least the research on it will be yummy! Hey Ned and Michell, I have been picking through your blog here one after the other, great stuff! Up in Valencia there was a tiny (I mean like a stand out by the road, similar to the sari sari’s) place that made pizza. I don’t know the name, but I was surprised how tasty this place was. It was within Valencia…not sure if it’s still there of course, but might give it a go if you can find it. The menu, as I recall, was just written on cardboard (probably a pizza box), with only a few choices. I think I know the place you are talking about. There’s also a place nearby that makes yummy homemade ice cream and another that has yummy burritos and tacos! Hey guys, I just want to say thanks for the videos and the blog you have created. Just to let you know I’m Filipino born in Quezon City. I’ve been living up in Canada since 1972. I’m practically Filipino-Canadian. I just wanted to say that the vidoes you produced brings back my childhood memories of HOME and I think I’m beginning to miss it more and more. Living in Canada is like living in a sardine can and the hussle and bussle of a metropolitan City. Yes Ottawa is a Metro. But compared to small provincial towns there. it’s like living in Messena NY where life is pretty much slower than big cities. I’m currently putting some funds aside and perhaps try to visit HOME again. You guys take care and keep up the good work. Kababyan. Thanks so much for that, Jerry. When I get messages and comments from Filipinos missing their home, I get a little mushy inside and it really makes all our work worth it – especially when it is OFW’s who are away from their homes for so long. Ingat, brother. …stumbled into your website …. Interesting ….I was born and raised in the Philippines and have not been back in years. Lived in the East coast, Midwest, and now presently living in the west coast. No immediate family ’cause they have all migrated in the States. Appreciate your website. Thanks. Thanks for the positive feedback, Perla. Much appreciated!